Product #22012 | SKU VZ-SPG-F | 0.0 (no ratings yet) Thanks for your rating! The Varizoom VZ-SPG-F is a manual zoom and focus controller kit for Fujinon professional/ENG lenses. 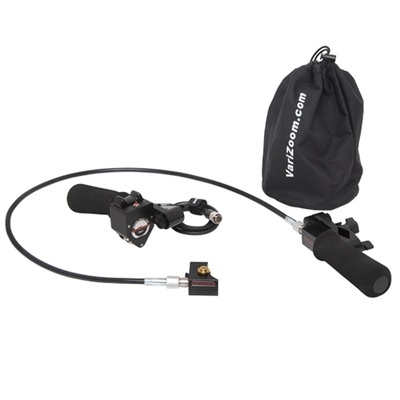 This kit comes equipped with both the VZ-PG-F zoom control grip and the VZ-FC-F focus controller. Remote precision control is made easy with this affordable package. The Varizoom VZ-PG-F is a pistol-grip style zoom controller built specifically for Fujinon's line of 8-pin professional lenses. The unit is compatible with most models and fits easily onto almost any tripod handle, jib or support bar. Machined from high-grade aluminium, the VZ-PG-F is designed to be both lightweight and extremely durable. Features include a pressure sensitive zoom rocker and speed dial limiter. The video return function lets users to play back the last 5 seconds of recorded material, allowing the tape to cue to the last recorded frame. This ensures no timecode errors, making sure footage is never lost or recorded over.